Canberra is the Capital of Australia and a fascinating place to see. Visit Parliament House, the National Gallery of Australia, the National Library, National Archives which feature old movies, records, books and artefacts as well as the War Memorial. Four days is Canberra is adequate to see most of the attractions. Canberra was selected as the national capital after a tug of intense rivalry between Sydney and Melbourne. And Canberra was handpicked as it was a midpoint between the two cities – this explains the aboriginal meaning. 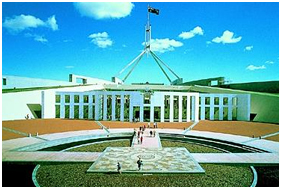 Canberra is the symbolic home of all Australians and the centre of political and administrative power in Australia. An ideal place for sailing, fishing, cricket, football and cycling, its climate is perfect for all these activities.